In our first installment, we take a look at overall production boosters that will help you to unleash your creative side and get things done. There are many iTunes controllers and information displays out there, but none works as well as Synergy ( ). It provides systemwide hot keys for playback and volume control; a snazzy, translucent informational display (track, artist, album cover, and so on) that fades in and out at the start of each track (or at your command); and optional playback controls—which you can customize with downloadable button sets—in the menu bar. (The playback controls also provide a menu that lists playlists and recent tracks.) The latest version of Synergy features support for Growl (a global notification system for OS X), as well as the ability to launch AppleScripts or other items on track or status changes (€5, about $6 at press time). Letting several people simultaneously make changes to a document has traditionally been a recipe for disaster. SubEthaEdit ( ) makes such collaborative efforts feasible—even enjoyable— by allowing an unlimited number of participants to join an editing session over the Internet or via Apple’s Bonjour (formerly Rendezvous). Each person’s contributions are tracked in a different color, and each participant can see what other participants are doing in the document. Integration with Apple’s iChat and Mail means that you can chat with or e-mail participants on the side. SubEthaEdit is also a full-fledged text editor, with powerful formatting and search-and-replace functions, and it provides automatic syntax highlighting via customizable styles. You can even export your documents to HTML, complete with author metadata. A Unix command-line tool lets SubEthaEdit interact with Terminal (noncommercial use, free; commercial use, $35). OS X’s Script menu is a great place to quickly access AppleScripts and shell scripts, but replacing it with FastScripts ( ) gives you even more functionality. The biggest advantage is easier creation of keyboard shortcuts—even application-specific ones—for scripts. But FastScripts also offers better performance, quick access to both user and systemwide scripts folders, on-screen script-feedback messages, and better menu organization. It now lets you run Automator workflows without having to launch Automator ($15). File Master Edit file permissions and attributes, get rid of stubborn files, and edit text files and the root user with FileXaminer. Among the myriad utilities that help you edit file information and permissions, FileXaminer ( ) has always stood out, and the latest version is even better. 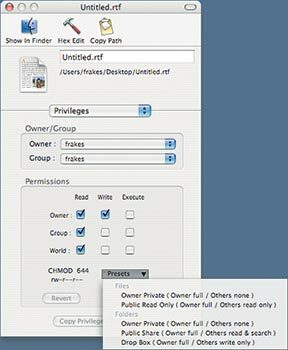 In addition to an easy-to-use interface for editing file permissions and attributes (including advanced attributes such as sticky bits), this utility provides Super Delete and Force Empty Trash functions—accessible from the Dock, Finder contextual menus, or the application itself—for getting rid of stubborn files. It also has a batch mode (for working with multiple files at one time), Finder integration, and systemwide support for contextual menus. Other features let you resize and convert images, edit icons, and edit text files as the root user. FileXaminer even lets you create and delete user groups without having to delve into Apple’s NetInfo Manager application ($10). If you’re a customer of Netflix, an online DVD-rental service, avoid the company’s Web site and use Netflix Freak ( ) instead. In addition to a much better interface for managing your movie queue, it offers improved searching and browsing of Netflix’s library to help you find the perfect movie. You can also quickly search your own queue and see your entire rental history. You can categorize rentals by who rented them—useful for keeping the peace at home—as well as by your own genres, and you can add your own notes to movie records. Netflix Freak now supports Netflix Profiles and multiple Netflix accounts ($15). If you’ve been struggling with transcribing content from a digital audio recorder, then Transcriva ( ) can help (although you still have to do the transcription work yourself). With its QuickTime support for many audio formats, mouse- or keyboard-controlled playback, and variable playback speeds, you can easily listen to your recordings as you transcribe. Even better, the program’s chat-like interface, with automatic time coding and support for multiple speakers, makes keeping track of conversations and interviews easy. There’s even a follow-along mode for checking your transcriptions—the text scrolls in time with the audio file ($20). Desks used to hold picture frames where computers sit today. But if you’ve got some spare room on your Mac’s desktop, you can add a virtual picture frame that rotates through your favorite images. Just point VirtuFrame ( ) at a folder of pictures (your iPhoto Library folder, for example), choose the frame size and style, and specify the rotation period. VirtuFrame then displays your images as though they were in a real frame (well, a real frame that changes photos automatically). You can also choose to keep VirtuFrame floating on top of all other windows, so you never miss a picture (free). Volumes Menu ( ) lets you quickly browse mounted volumes via a hierarchical menu in the menu bar. The app is a spin-off of Butler (a file launcher, bookmark manager, Web-search utility, pasteboard extension, and more) and includes some of Butler’s volume-browsing functions (free). Do you spend too much time in front of your Mac? Do you forget to take breaks? Time Out ( ) reminds you at regular intervals, to, well, take some time out from your computing. Or more accurately, it forces you to do so by dimming your screen for the duration of the break. (You can postpone or skip a break if you’re in the middle of an important thought.) And if you remember to take a break on your own—or just go to get a cup of coffee—Time Out counts that as a break (free). If you’ve got multiple Macs, chances are your iTunes Libraries are out of sync. They don’t have to be. With syncOtunes ( ), you select your current Mac’s iTunes Music Library.xml file, connect to another Mac through personal file sharing (which you can enable in the System Preferences Sharing preference pane), and then select that Mac’s Library file. syncOtunes will list missing files from each Library, and it will then let you decide whether to copy the miss-ing files in both directions. Unfortunately, you then need to import the new tracks into iTunes on each Mac—syncOtunes has some useful features that make the process easier, but it would be nice if the program performed this step automatically (free). RadioLover ( )—a descendant of the popular StreamRipperX—lets you record MP3-based Internet radio (both streams listed in iTunes and those you enter manually) and adds the resulting recordings to iTunes. You can record mul-tiple streams simultaneously, schedule recordings, and opt to automatically split recordings at set intervals. RadioLover can even split recordings that include track information into individual tracks and then tag them for you ($15). Do you like Stickies but want something a bit less conspicuous? Sidenote ( ) hides a notepad that supports rich text, images, and PDFs on the edge of your screen—the notepad appears when you move the cursor to the screen edge, and it slides off the screen when not in use. You can create multiple notes and use the keyboard or a pop-up menu to switch between them. You can even drag content from the Finder or another application to Sidenote; the Sidenote notepad slides out to accept the content (free). Screen Capturer SnapNDrag makes taking screenshots easy, and it does more than OS X’s Grab application. If you don’t need the power and features of Snapz Pro X but find that OS X’s Grab utility is too limiting, SnapNDrag ( ) may be the screenshot utility for you. Click on a button representing the type of shot you want to take—screen, window, selection, or timed—and then choose the desired screen, window, or part of the screen. A small preview of the shot appears; you can then save the shot, drag it to the desktop, or drag it directly to an e-mail message or another application. The Pro version adds hot keys and image scaling (free; Pro version, $5). OS X lets you assign keyboard shortcuts to menu items, but Spark ( ) lets you do much more, such as create hot-key shortcuts that run AppleScripts, launch applications, open documents, control iTunes, and execute system actions (log out, sleep, restart, and shutdown). You can also make the shortcuts conditional (do different things depending on the application). The program allows you to import and export its shortcut libraries—great for using the same shortcuts on different computers. And Spark can make an HTML cheat sheet of your hot keys for you (free). If you can write a shell script but have no clue how to create an OS X application, Platypus ( ) is for you. It lets you create an app based on a shell script (or other script, such as Perl, Python, PHP, Ruby, Expect, Tcl, or AppleScript)—you get the functionality of the script in the user-friendly environment of a graphical application. The resulting application will even support drag and drop—when you drag a file onto the app, the file’s path is passed to the underlying shell script as an argument. You can also add features such as progress bars and text-input windows (free). For physics teachers and students, Physics 101 SE ( ) is a great tool for figuring out the results of physics formulas and understanding how those results were calculated. The 80-plus formulas are organized by topic (work, momentum, thermodynamics, electricity, optics, and so on) and let you type in known values to solve for an unknown. And when you click on the question-mark button next to a formula, Physics 101 SE will provide an explanation of the formula and display the calculation that was performed. The application also includes special modes for simulating projectiles, building virtual circuits, and more ($10). OSX’s built-in Colors palette is quite good, but Painter’s Picker ( ) provides more-advanced color picking for people in creative fields. It includes detailed controls for choosing brightness, saturation, and hue angles; the ability to quickly find complementary or analogous colors; RGB, CMYK, and Web-safe spaces; and much more. And the best thing about Painter’s Picker is that, as a plug-in that adds an additional panel to OS X’s Colors palette, it’s available systemwide ($16). , press enter, and then click on the subtract button (-). Measure’s biggest drawback is that because it can do so many things, it can be a bit confusing to use ($39). Do you wish Address Book had better features for printing envelopes and labels? Mail Factory ( ) lets you create custom label and envelope layouts—by dragging address elements, images, and more onto your chosen label or envelope size—and then print them with the addresses of contacts in Address Book, Entourage, Eudora, or many other contact databases. You can use the included templates for pretty much any label or envelope printer, or let Mail Factory walk you through the process of creating your own format and style ($40). Looking for a powerful drawing application but don’t want to spend big bucks for Adobe Illustrator CS2? Then you’re going to love Intaglio ( ). Although it isn’t as rich in features as the $499 Illustrator, Intaglio has all the drawing and graphics tools that most people need. The program also takes advantage of many OS X features, via a Spotlight importer; Automator actions; and support for AppleScript, Apple Type Services, and Quartz graphics tools. The ability to convert PDF, QuickDraw, and ClarisDraw files, and to import from and export to Apple’s Pages and Key-note programs, is also sure to please. 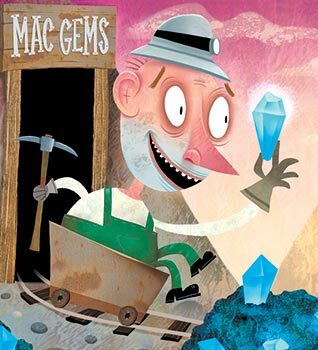 At $89, Intaglio isn’t as inexpensive as most Mac gems, but compared with Illustrator, it’s a bargain ($89). Drop a file or package onto File Juicer ( ), and it will search the contents and extract any recognizable JPEG, PNG, GIF, PDF, BMP, WMF, EMF, PICT, TIFF, Flash, Zip, HTML, WAV, MP3, AVI, MOV, MPG, WMV, MP4, AU, AIFF or text files contained inside. This is a great way to extract images or sound files from applications or PowerPoint presentations. File Juicer can even extract images and Flash files from Windows .exe archives and rescue files from corrupt disk images. I sometimes use File Juicer to view the contents of a mysterious .dmg image without mounting it ($8). Tiger’s Spotlight feature makes extremely careful organization less necessary than it was in previous versions of OSX, but if you have a penchant for order, FolderOrg ( ) may be for you:when you drop items into a folder, this Folder Action automatically places them into dated subfolders—the items added to a folder on a certain date are filed in a subfolder that has that date as its name (free). If you spend a lot of time preparing photos for the Web, ImageWell ( ) can help streamline the process. Drag an image into the “well” to begin using the app’s numerous editing features (crop; shape; rotate; resize; watermark; and add borders, drop shadows, labels, and text). Then click on the Send button; ImageWell will create the new image (in the format you choose) and upload it to your iDisk, FTP site, or WebDAV server. ImageWell even gives you an estimation of how long it will take a modem user to download the image— so you can adjust the size if necessary—and copies the URL of the image to the Clipboard after uploading. ImageWell won’t replace Adobe Photoshop, or even Lemke Software’s GraphicConverter, for more-demanding image editing, but it’s a great tool for the casual image editing and upload-ing that most people do (free).